A research arm from Singapore is showcasing some work done to encourage physical activity in older adults (seniors). Using a Kinect sensor to interact with a simple ping-pong game interface, seniors can game their way to better health. 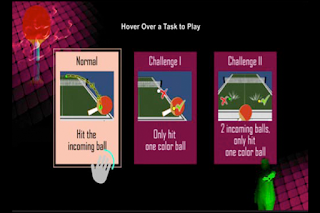 For the task of selective attention, two balls will fly out simultaneously, where only the ball of a specific colour is the target. For the inhibition task, the ball in some rounds will be of a different colour, and players are required to ignore balls of a given colour while hitting balls of other colours. The innovative data analysis tools at the back end enable healthcare professionals to easily track the health conditions of each individual elderly user under their care, and assist in crafting personalized training programs.